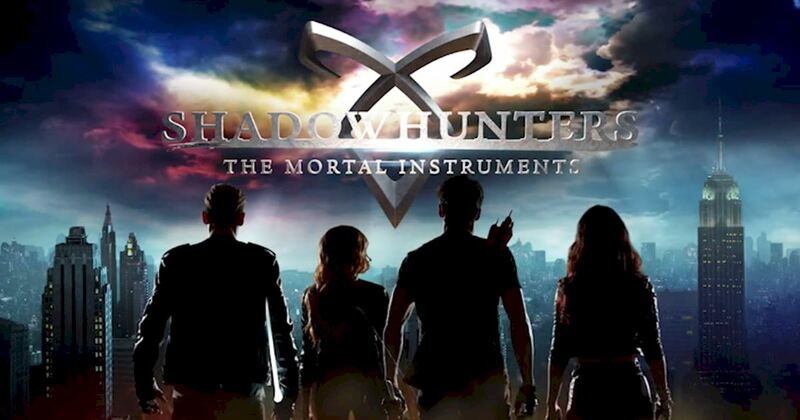 Shadowhunters: The Mortal Instruments is based on Cassandra Clare's The Mortal Instruments book series. Previously, there was a movie based on just the first book, City of Bones, but it didn't do very well, and any plans for sequels were scrapped. (See my review of the movie here.) But, since it's still such a popular series, they didn't quite want to give up on it yet, so it is now a TV series on Freeform (formerly ABC family), with an all-new cast. Short summary: The series focuses on Clary Fray, who finds out after her mother's kidnapping that she is actually a shadowhunter, an ancient race of demon hunters. Her mother has been kidnapped by an evil dude named Valentine, who was long presumed to be dead and who is looking for something called the Mortal Cup so that he can create his own army of shadowhunters for his own nefarious purposes. With the help of human best friend Simon and shadowhunters Izzy, Alec, and Jace, she plans to get her mother back and really figure out who she is. The rest of my post may contain spoilers for both the book series and the tv episodes. The pilot premiered last night, and apparently episode 2 was also available via the Freeform app and Xfinity On Demand, and since I have no talent for delayed gratification, I decided to watch both of them. Both episodes were heavy on exposition, which is to be expected. I get that it's hard to take book narration and turn it into dialogue smoothly as far as exposition is concerned, but on MANY occasions, I found myself saying, "Wow, that character just spewed out an abnormal amount of information!" It just didn't quite feel natural or likely, but again, I get it. The information needs to be communicated somehow. In general, though, the acting and dialogue felt off or forced or overdone at times, and I know dramatic things happen right off the bat, but sometimes Clary's hysterics or crying seemed a bit much. This is probably my biggest complaint - not the liberties taken with the story, but the actual performances and some of the writing. Luckily, though, that's something that can improve over time, as actors and writers find their groove; pilots are always rough. I don't have complaints about the changes themselves, though I will definitely say that the movie was more faithful to the events of the novel than the show has been so far. Books, movies, and television all have subtle and not-so-subtle differences, and it's impossible to keep everything the same between all three. But that's not a bad thing - after all, the Vampire Diaries show is nothing like the (original) book series, and it was still done very well. In the book, Clary is 16, and Jocelyn is really hesitant to tell Clary about their shadowhunter heritage. On the show, she is 18, and her 18th birthday is what prompts the magical brain spell to start wearing off, and so Jocelyn does actually have big plans to tell Clary the truth. Also, we find out who Valentine is pretty early on - we see him in the first episode (he's hiding out in Chernobyl), and we already find out in episode 2 that he is Clary's father. I feel a little bit like that was showing your cards too early, but I suppose they have a purpose for introducing him so soon, other than showing him being evil and not caring when his henchmen die. As I said in my movie review, Valentine is supposed to have this charismatic, seductive quality to him - how else would he have gotten people to join his Circle? - and I don't quite see that about this Valentine yet. I have yet to truly see a good Valentine performance that really made me see what, say, Jocelyn would've seen when she married him. Another major change is that instead of living upstairs from a fortune teller named Madam Dorothea, there's a brand-new character named Dot, who is a warlock that works for Jocelyn at her art gallery (?) shop. I'm interested in seeing where they go with her character. Also, Luke works for the NYPD instead of owning a bookshop. He is apparently still a werewolf, though that is hinted at rather than being overtly revealed. There is also another character named Maureen, who is in a band with Simon and has a crush on him. I don't know how important she is supposed to be or how long she will stick around. Some inevitable comparisons between the movie and the show so far: again, panned as it was, the movie was actually much closer to the book (aside from the last half hour). I actually enjoy the movie quite a bit, as long as I don't watch all of it. (Yes, I do actually stop it around a certain point if I don't want to get angry.) I did really love the movie cast, except for maybe the guy who played Alec. (Sorry! I'm sure he's a really nice dude and good in other things!) I mean, it's hard to argue with Lena Headey kicking demon arse. I liked Lily Collins, whose Clary came across as a little more savvy and New Yorky (I don't even know what I mean by that) than Katherine McNamara's, and I loved Jamie Campbell Bower's capacity for snark as Jace, though to be honest, the show's writers didn't give Dominic Sherwood any good zingers. (I loved Dom in Vampire Academy, by the way, which I felt was undeservedly panned.) Simon is just as loveable in both editions, though I kind of prefer the look of Robert Sheehan (just, as a personal preference). I do like tv Alec and Izzy much better than in the movie - I didn't have any complaints about movie Izzy, but I feel like tv Izzy looks more like what I imagined (aside from her height), and tv Alec is just the right amount of b*tchiness to him. PS - Hodge is played by a MUCH younger dude than Jared Harris, and in the show, it's not just the three kids and him - there are a bunch of other shadowhunters living and working at the Institute. They even have computerized tracking software and stuff like that, which I'm not used to because I always assumed that they were totally old school about everything. Luke is played by the Old Spice guy!!!! Which is awesome. And which also means that Luke is black. Which is even MORE awesome. In fact, what hit me most is that there is more ethnic diversity on this show than I am used to seeing in anything that isn't specifically made for or about POC, and that's not even including Magnus and Raphael the vampire (whom we see at the end of episode 2) - Luke, Izzy (I'm not sure what race she is supposed to be, but the actress is Mexican-Lebanese), Maureen, Dot (she looked ethnic to me? ), as well as several of the various henchmen, background characters, etc. In short, I could believe they were in New York because the show had the visual diversity that one would expect to see in New York. It was pretty refreshing, and I hope they keep including more POC actors. My only major disappointment is that we've barely seen Magnus Bane. Like, we see him a few times, in all his guyliner and glitter glory, but it's not enough. MORE MAGNUS. MORE. In short, I will keep watching, because I am curious to see where this will go, and hopefully the cast and crew will hit a good stride. Good job, Shadowhunters - you've got me for at least a few more episodes. I'll see you back here for episode 3!